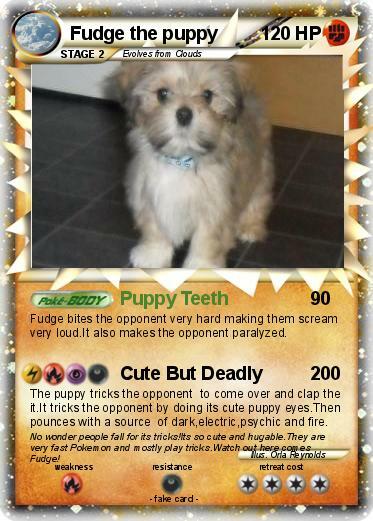 Fudge bites the opponent very hard making them scream very loud.It also makes the opponent paralyzed. The puppy tricks the opponent to come over and clap the it.It tricks the opponent by doing its cute puppy eyes.Then pounces with a source of dark,electric,psychic and fire. Comments : No wonder people fall for its tricks!Its so cute and hugable.They are very fast Pokemon and mostly play tricks.Watch out here comes Fudge!